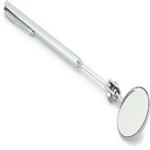 • Telescopes from 5-1/2" to 21-7/8"
New from Titan Tools, this telescoping inspection mirror has a 2 inch diameter and features a comfortable textured cushioned grip. • Telescopes from 9-1/2" to 28"
Features interchangeable 1m long camera tipped probe and remote viewing. User can also record images or video on the included SD card or on a computer. 12mm dia. probe. Unit features a standard pistol grip along with a detachable, 3.5'' diagonal color monitor with a 4x zoom and 180 image rotation capabilities, as well as a remote viewing range of up to 32' (10m).